Perge is one of the most well-known cities of Lycian union both in Hellenistic period and later in Roman world with school of sculture and famed sculptors. The city also used to be capital of Pamphylia once upon a time. Perge was the important stop for St. Paul who spent some time in this city in order to advertise Christianity during his missionary journeys in the first century AD, made his famous speech to the followers of Christ after returning from Cyprus and was boarded in Perge to go to Rome. 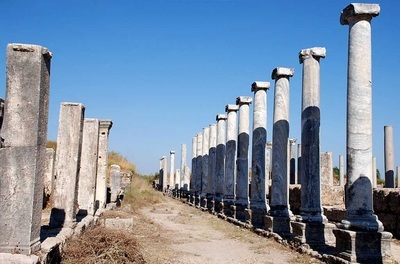 Perge is located in the east of the border Aksu town which is about 18 kms from Antalya airport and is based on the Aksu River. 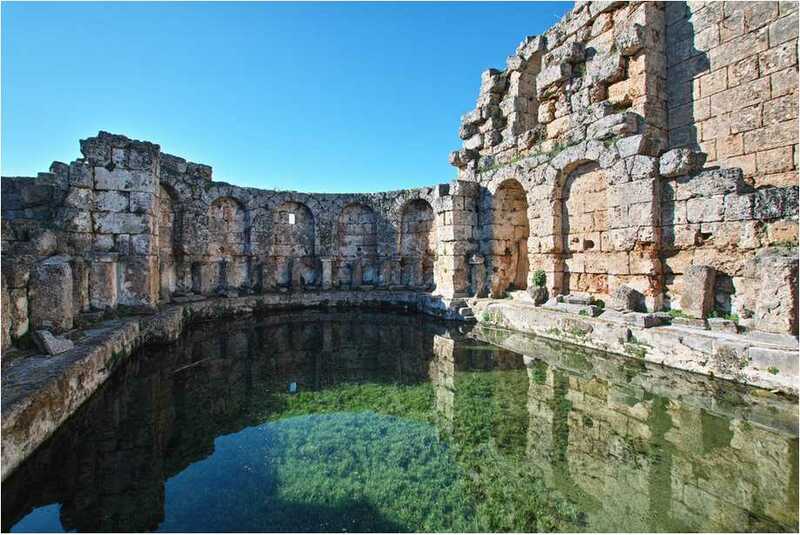 It takes half an hour to reach Perge from Antalya city center and it belongs to Antalya province. Its neighbours are ; Döşemealtı and Kepez in the West, Serik in the east and Burdur is in the north. The center of the district is in the west of the Aksu River. 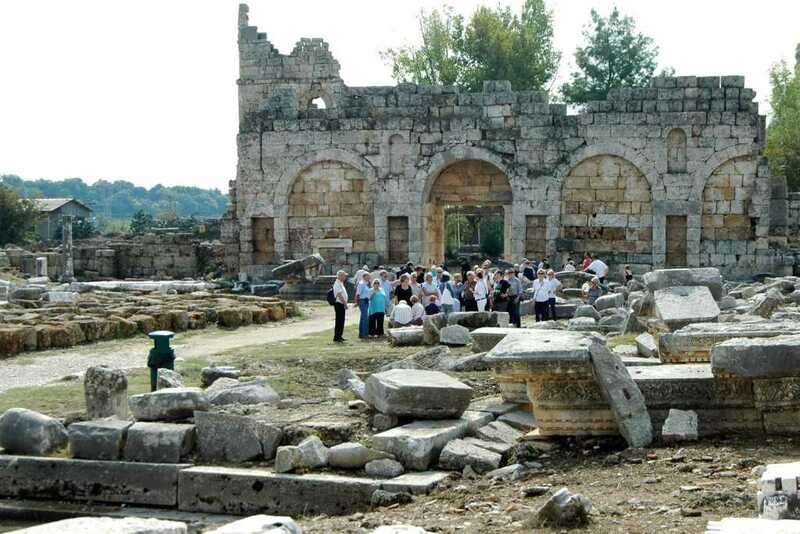 Ancient Perge which was one of the nicest cities of the antiquity is 4kms from Aksu town. 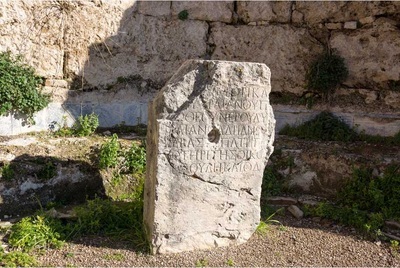 According to ancient historian Strabo, Perge was discovered by colonists from Argos city under the leadership of heros Mopsos and Calchas after the Trojan War in 11th C BC. The sculptures of Mopsos and Calchas found in excavations show that they were the mythological founders of Perge. It is known that Perge was ruled by the Greeks in between 7th and 6th centuries BC and later was under the rule of Persians till the time of the Alexander the Great. In 334 BC after the battle of Granicus, Alexander the Great saved Asia Minor from Persian occupation and Perge was handed over to Alexander without any resistance. Although the city was protected by a strong city walls in the classical period, it must not have been wanting to fight with the powerful Macedonian Army. After the death of Alexander, Perge has been a domain of Antigonos in a short period and then fell under Seleucid rule and was added to Pergamene kingdom later. When the kingdom of Pergamum was given to Rome by Attalos III, Perge became an important Roman city in the region of of Pamphylia. In 79 AD Roman statesman Cicero came to Perge and a became the governor. In 46 A.D Perge hosted a major event for the Christian world, as the Apostle of the Activities section mentioned in New Testament, St. Paul came to Perge from Cyprus, he went to Antiocheia in Pisidia and then he gave a sermon in Perge after returning from Pisidian Antiocheia and finally departed to Attaleia during his first missionary journey. 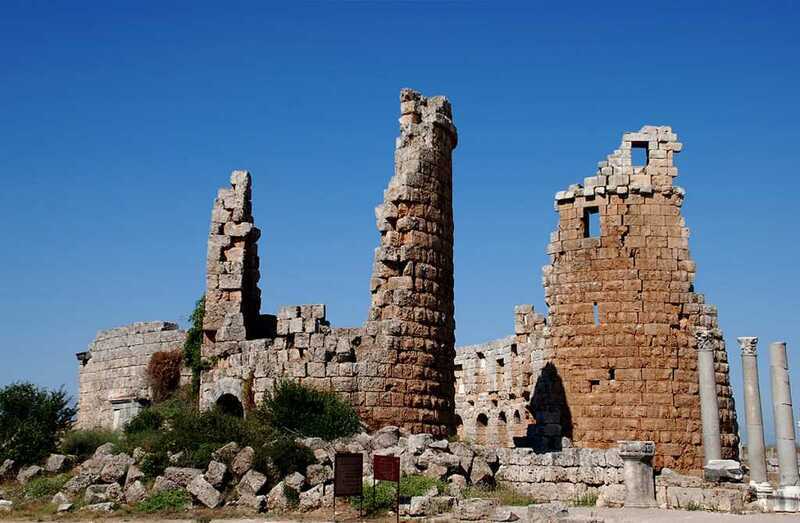 From the beginning of the Roman Empire period, major construction projects have been implemented in the city of Perge and Perge has become one of the most beautiful cities , not only in Pamphylia but also in the whole province of Asia Minor in the the second and third centuries A.D. In first half of the fourth century AD, Christianity was declared as the the official religion of the Roman Empire by Constantine the Great and Perge was one of the important episcopal see. 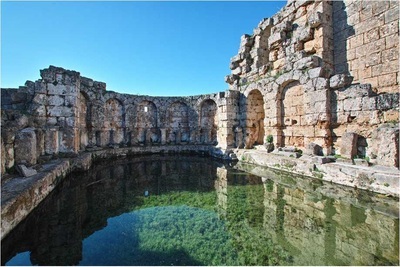 Perge lost its remaining power with the Arab invasions in which began in the mid-seventh century A.D. and a large portion of the city in this period emigrated to Antalya. Seljuk Turks captured the area in 12th century and it was added to Ottoman empire in 14th century. Aksu was founded 4kms after the ancient ruins as a small nomadic village in 16th century and it was added to Antalya city during the republican time. Now Aksu is a district greater Antalya region with the population of 25.000 inhabitants. 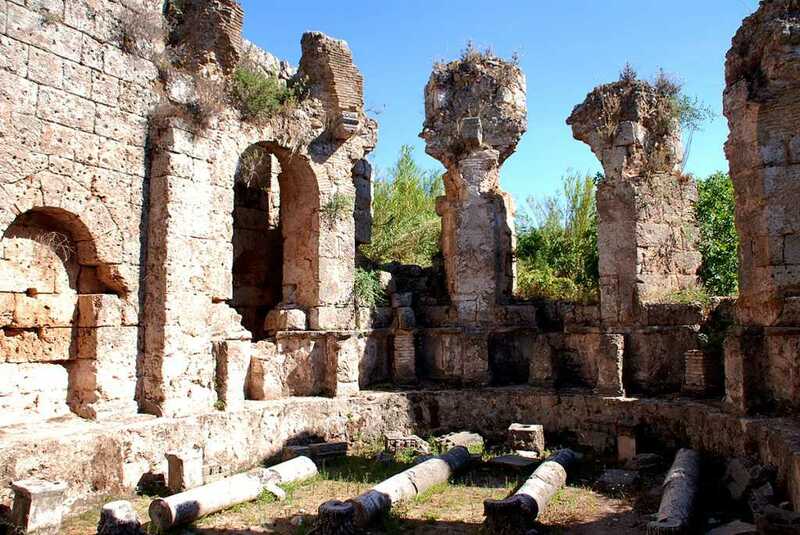 The first building facing a person who enters Perge is the Greek-Roman type theater which was built on the southern outskirts of Kocabelen hill. The cavea, spectators’ seats, slightly larger than half circle, is divided by a broad diazoma. The total seating capacity of the theatre is 13.000 consisting 19 rows at the bottom and 23 rows at the top. The entry and exit paths of the theatre were made other in different directions in accordance with the rules of the Roman theater architecture. The viewers from both ends passing through the archway and stairs and reached the side exit doors located on both sides then they were distributed to where they were seated. Orchestra was used as a gladiator arena where the wild animal fights were held duing the first, second and mid-third centuries A.D.This area was surrounded by carved panels passing through marble balls to prevent the escape of animals. Partially standing two-storey stage building with colonnaded architecture and sculpture decorations can be dated to the middle of the second century A.D. The most distinctive feature of the theater are mythological reliefs that decorate the face of this podium. The reliefs are nymphs personifying the Aksu River, god of wine and theater founder Dionysus and other local gods of Perge. Unfortunately,these beautiful reliefs were damaged as the result of the crash scene building. The stadium , on the right of the asphalt road leading to the town from the theater, is one of the best preserved stadiums to have survived from antiquity. This huge rectangular building measuring 34x334 meters is a horseshoe-shaped at the northern end and South side is open. There are seventy-vaulted rooms under the stadium. These rooms are connected to each other and are engaged in a theater in all three compartments. This area is inscribed with the names the owners and the list of the articles for sale so we can understand that they were the shops. The rows of seats on the arched rooms provide a seating capacity of 12,000.Although it was built for chariot races and some entertaintment in the second century A.D. It was converted into an arena surrounded by a protective cage of the northern end of the stadium when gladiatorial combat became popular with wild animals in the middle of the third century A.D. The famous sarcophagus in Perge, called Plancius Verus, belongs to the daughter of the governor of Bithynia Plancia Magna. Plancia Magna was a woman with a wealthy and civic consciousness whom she was leading of all public affairs in Perge. She used to be mother nun of planners mother goddess Magna, chief priestess of Artemis Pergaia and priestess of the imperial cults. A large part of Perge are surrounded by walls some of which dating back to the Hellenistic period. On top of the fortifications 12 - 13 meter high towers were built but during the Pax Romana the fortifications lost their importance ensuring with the lasting peace and tranquility and the buildings such as theaters and stadiums were built beyond the walls without fear. After the entrance gate at the beginning of the city walls, there is a monumental fountain that was built in honor of emperor Septimus Severus. 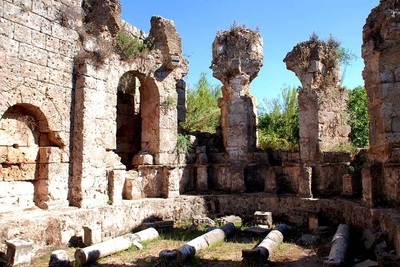 The pieces of monumental fountain and the sculptures of Perge are on dislay in Antalya museum today.